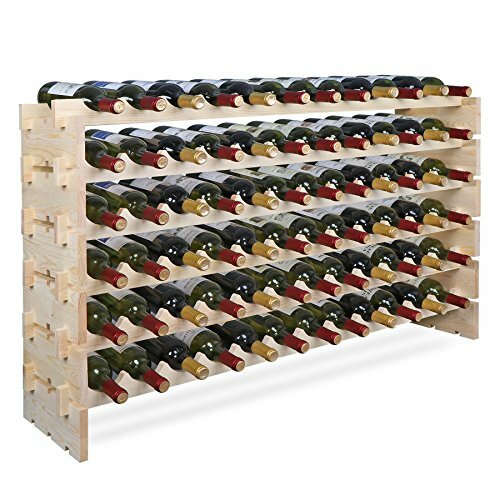 This 72 Bottle Wine Rack from Smartxchoices is crafted from premium quality wood which is sturdy and long-lasting. It has a huge capacity of effortlessly holding 72 wine bottles. This eco friendly wine rack can be easily floor mounted. The efficient design of the modern wine rack ensures that the wine bottles are stored in a organized manner. Sturdy, No Wobble: Made of high quality pine wood to ensure sturdy construction with compact capacity,arc design prevent wine bottles scattered around dowel pins to inter lock each connection point. The thickness of this hardwood is 18mm, smooth but durable material to ensure your wines safety. 100 percent no wobble guarantee. Classic Design: Classic design to accent any home, kitchen, dining room, or wine cellar. Versatile modular stacking style,wave shaped shelves,arc design prevent wine bottles scattered around dowel pins to inter lock each connection point. Unfinished wood gives option to stain, paint, varnish or leave as it is. Easy to Assemble: Each piece of wood has slots with either a dowel or a hole so they can fit together well. Super EASY to assemble (10 minutes or less). There is no heavy, time consuming assembly required with these wine racks, easy to put together without any tools,all accessories are included in the package, as well as detailed instructions. Elegant, Functional: This wine table keeps your wine bottles closer at hand, making it very handy for cocktail parties with your family or friends. This little wine rack will fits perfectly in your home like living room, cellar or dining area etc. Overall Dimension: Assembled measurements: 47"L x 11.8"W x 27.5"D. Holds up to 72 bottles (6 Layers , 12 bottles each layer), 3.5 inch opening will hold standard size wine bottle (750ML). Product Weight: About 18 Lbs. If your wine rack planks got damaged during transit, please contact us to get parts replacement firstly.